The 2030 Agenda for Sustainable Development recognizes not only the importance of a separate education goal but also the need to achieve other goals through education. Among SDGs other than SDG 4, there are indicators that refer to education directly and indirectly. Education is directly mentioned in five global indicators outside SDG 4: on government spending on education, health and social protection; on education as a means of achieving gender equality; on youth not in education, employment or training; and on global citizenship education and education for sustainable development. In addition to monitoring indicators that explicitly refer to education, future GEM Reports will pay attention to indirect references to education in the other SDGs. Three examples are highlighted: education as a factor associated with other development outcomes; indicators that refer to human resource capacity, which are related to professional and higher education; and the potential role of adult education. Disaggregating relevant global indicators by education levels would shed more light on the underlying inequality that obstructs achievement of the SDG targets. Global indicators that could be monitored this way include those related to poverty, malnutrition, child marriage, access to improved sanitation, access to electricity, unemployment, slum populations, recycling, disaster deaths, violence and birth registration. 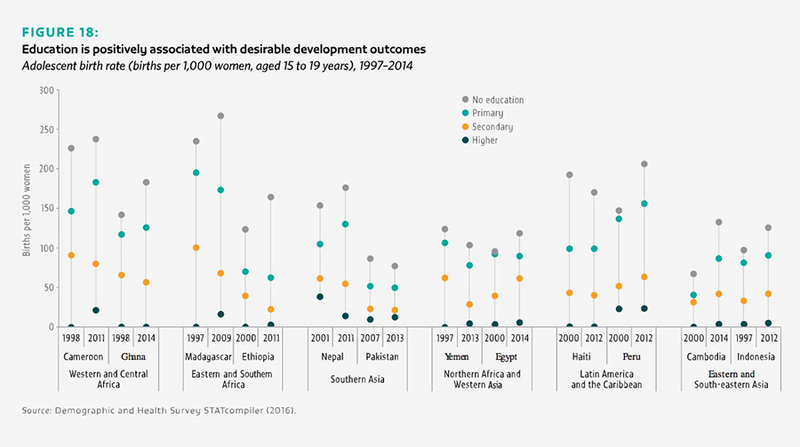 For example, across 54 low and middle countries with data for 2008–2015, the average number of births per 1,000 women was 176 among women with no education, 142 with primary education, 61 with secondary and 13 with tertiary.